New Delhi: In what appears to be a Valentines day gift by the government to the heart patients across the country, the National Pharmaceuticals Pricing Authority has announced the the upper price ceiling for different kinds of Cardiac Stents that are being used in the country. 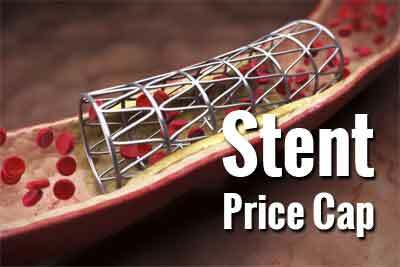 With the said ceiling in force, the NPPA is seen slashing the prices of these stents by even upto 85% in some cases. The prices of Bare Metal Stents has been fixed as mere Rs 7260 where as those of Drug Eluting Stents (DES) including metallic DES and Bioresorbable VascularScaffold (BVS)/ Biodegradable Stents has been fixed at Rs 29,600. The prices shall be valid for a period of one year since the date of notification. No distinction has been made between the DES as well as Biodegradable stents, as was heavily demanded by the industry. Profiteering, by itself, is evil. Profiteering in the scarce resources of the community, much needed life-sustaining foodstuffs and life-saving drugs is diabolic. It is a menace which has to be fettered and curbed. One of the principal objectives of the Essential Commodities Act, 1955 is precisely that. It must be remembered that Article 39(b) enjoins a duty on the State towards securing ‘that the ownership and control of the material resources of the community are so distributed as best to subserve the common good”. As per paragraph 24(4) of DPCO 2013, every retailer and dealer shall display price list and the supplementary price list, if any, as furnished by the manufacturer/importer, on a conspicuous part of the premises where he carries on business in a manner so as to be easily accessible to any person wishing to consult the same. 2. Wherever institutions such as hospitals/nursing homes/clinics performing cardiac procedures using Coronary Stents are billing directly to the patients, they shall be required to comply with the ceiling prices notified hereinabove and follow the applicable provisions of the DPCO, 2013 including above. Institutions such as hospitals/nursing homes/clinics utilizing Coronary Stents shall specifically and separately mention the cost of the coronary stent along with its brand name, name of the manufacturer/importer/batch no. and other details, if any, in their billing to the patients or their representatives. Any manufacturer or institution or person not complying with the ceiling price and notes specified hereinabove shall be liable to deposit the overcharged amount along with interest thereon under the provisions of the Drugs (Prices Control) Order, 2013 read with Essential Commodities Act, 1955. 5 13. The ceiling price fixed hereinabove shall be maintained for a period of one year from the date of this notification, unless revised by another gazette notification. The ceiling prices specified in column (4) of the above table shall be applicable from the date of publication of this notification in the Gazette of India Extraordinary and shall also be applicable to all the stocks of Coronary Stents available for sale in the trade channel. (b) All manufacturers of Coronary Stents, selling branded or non-branded or both versions of stents at prices higher than the ceiling price (plus local taxes as applicable) so fixed and notified by the Government, shall revise the price of all such stents downward not exceeding 4 the ceiling price specified in column (4) in the above table, plus local taxes as applicable and paid, if any. (c) All manufacturers/marketers of Coronary Stents having MRP lower than the ceiling price specified in column (4) in the above table plus local taxes as applicable and paid, if any, shall continue to maintain the existing MRP in accordance with paragraph 13 (2) of the DPCO, 2013. (d) The manufacturers may add local taxes/VAT and no other charges in the calculation of MRP, if they have actually paid such taxes or if it is payable to the Government on the ceiling price specified in column (4) of the above said table in paragraph (12) of this order. (e) The ceiling price for a pack of coronary stent shall be arrived at by the concerned manufacturer/importer in accordance with the ceiling price specified in column (4) of the above table as per the provisions under DPCO, 2013. (f) The manufacturers under Paragraph 24 of DPCO, 2013 shall issue price list in Form–V as prescribed in Schedule II of the DPCO, 2013 to the NPPA online through Integrated Pharmaceutical Database Management System (IPDMS) and submit a copy to all State Drug Controllers and all distributors/dealers/retailers. They shall also furnish quarterly return to the NPPA, in respect of production / import and sale of Coronary Stents in Form-III as prescribed in Schedule-II of the DPCO, 2013 through IPDMS. (g) As per paragraph 24(4) of DPCO 2013, every retailer and dealer shall display price list and the supplementary price list, if any, as furnished by the manufacturer/importer, on a conspicuous part of the premises where he carries on business in a manner so as to be easily accessible to any person wishing to consult the same…. (h) The ‘manufacturer’ for the purpose of this order means any person who manufactures or imports or markets Coronary Stents for distribution or sale in the country. (i) Any manufacturer or institution or person not complying with the ceiling price and notes specified hereinabove shall be liable to deposit the overcharged amount along with interest thereon under the provisions of the Drugs (Prices Control) Order, 2013 read with Essential Commodities Act, 1955. 5 13. The ceiling price fixed hereinabove shall be maintained for a period of one year from the date of this notification, unless revised by another gazette notification.